"A fast and easy recipe that is great for mailing to friends and family, festively snowy white, and very tasty with a pleasantly crunchy and chewy texture. This recipe originally comes from my great-grandmother and has been handed down through four generations. My Grandma Sally makes these almost every year for Christmas and it is one of my favorite Christmas cookie recipes. The cookies will be chewy-crunchy when finished cooling, not gooey." Beat egg white in a bowl with an electric hand-mixer until stiff peaks form. Gradually beat sugar, 1 tablespoon at a time, into egg whites until fully incorporated. Stir salt and vanilla extract into egg whites until thoroughly mixed. 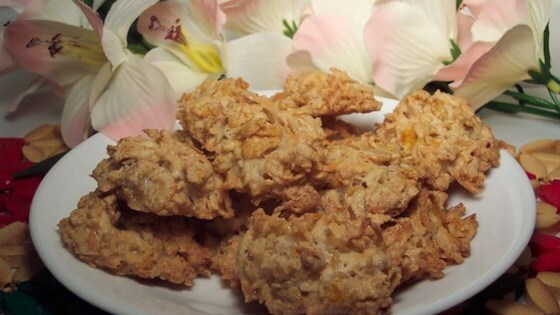 Fold coconut and corn flakes into the mixture. Drop coconut mixture by the teaspoon onto the prepared baking sheet. Bake cookies in the preheated oven until lightly crisp, 20 minutes. Transfer cookies to wire rack to cool, at least 15 minutes. Make an effortlessly elegant entrance to any party. Fast, nice and easy. But too sweet! Ideal for a party or special occasion. These were okay cookies, very easy to make for a sweet treat. I doubled the recipe and only got about 34 cookies, using a teaspoon to scoop it out with.